He forgot he is also under authority. As a Christian myself, I am always amazed at these Bushites whom want to force their own moral code on everyone else. If being a Christian isn't tough enough w/o having to make excuses for these crusaders. They like the money hawkers on TV have a special, extra hot pit in hell awaiting them. Not just for the souls they oppressed but, the ones whose blood is on their slimy hands. Yes,many a lawmaker has ordered the death of their constituents for consensual crimes that,are between man and his God. They are murderers and traitors......and sadly re-elected by those that also lust for the blood of their neighbors. He even slays those of his own household to feed his desires. What an evil and selfish man. "no one dies to himself". They forget the results of not self applying God's moral code...."you reap what you sow". Souder,you're no brethren of mine in Christ. Not for adultery alone but, for the murder of every value around you. I'm not a Christian myself. However, I believe the tenets of the Judeo-Christian ethic to be true and correct, for my culture is the culture of western civilization. There is payback for ones evil deeds by a Higher Power here on this earthly plane too; Souder is just starting to get (feeling his too). He'll just become a lobbyist, go to work for a non profit foundation or write books and go on the lecture circuit and be paid to continue to perpertuate his evil agenda that is bad for a Free country and hurts humanity. Sadist. It's true what the Evangelical have been saying for 25 years, "Evil people die nasty"; it's a Higher Power's payback here on the earthly plane for commiting an blasphemy or an affront to God. Maybe he will be punished, and maybe he won't. What I do know is that he is going to have to deal with his entire life's work destroyed. This is unimaginably cruel, even for scum like him. The "evil" cannabis will be openly consumed despite his beleaguered protests. When it is legal; I hope everyone is not too happy to forget him, and those like him for the abominable liars they are. If nothing, society will punish him with a life of anonymity, and barely concealed disgust even if anyone recognizes him. Souder is a freak, glad to see him go!! I am so relieved he has been exposed as the vile hypocrite he is. However, I would rather that he had gotten a chronic painful disease so he would know what it is like to live in uncurable and constant suffering. Unfor. he, as he has money and connections, would probably find a doctor to prescribe him narcotics while the rest of us are rebuked and abused by society. He has hurt a lot of innocent people railing against an extremely safe and effective pain medicine. People who usually lack power in our Big-Pharma loving culture who are left to suffer. One day people will look back and the prohibition of pot and shake their heads in disbelief. Thanks God, he is out of office, I can only hope a better human being takes his place. 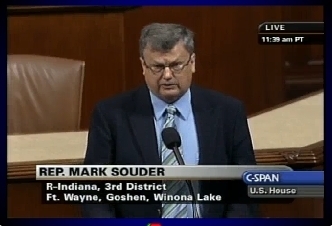 This Souder guy is about as despicable as they come. All the students he's hurt with his onerous amendments stopping federal college funding to anyone who smoked a joint. And then he has an affair. Despicable. Too bad he can't be locked up. His abstinence partner in crime? Man that is so perfect.